Joi﻿n the team to help D﻿avid win! ﻿I am not a politician. I have never run for office before. I am a teacher and an engineer. I taught Computer Engineering at ASU for 30 years. Before that, I served as an officer in the United States Air Force. I am also the founder of Western Microsystems, a company that designs and develops custom software, especially for microprocessors and embedded systems. Now I have the time and energy to give back to my community. 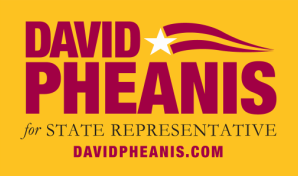 I am running for the Arizona House of Representatives because I want to bring good judgment, common sense, and conservative fiscal discipline to the legislature. I believe the legislature should focus on important issues and should avoid spending time on divisive side issues that don't provide any benefit and often end up embarrassing the legislature and the state. To me, the important issues that deserve the undivided attention of the legislature are jobs and the economy, education, and control of government spending. I want to cut government red tape that impedes job creation and the growth of business in our state. The government should foster job creation, not hinder it. I strongly support education and want to improve education at all levels so our children can grow up and get good jobs, thereby creating a strong, resilient economy. I have always been careful with my own finances, and, as a lifelong fiscal conservative, I will be equally careful with the state's finances. I believe that logical reasoning and rational discourse have a place in legislative decisions. I will carefully consider the arguments relating to each issue, and I will evaluate each issue on a case-by-case basis.